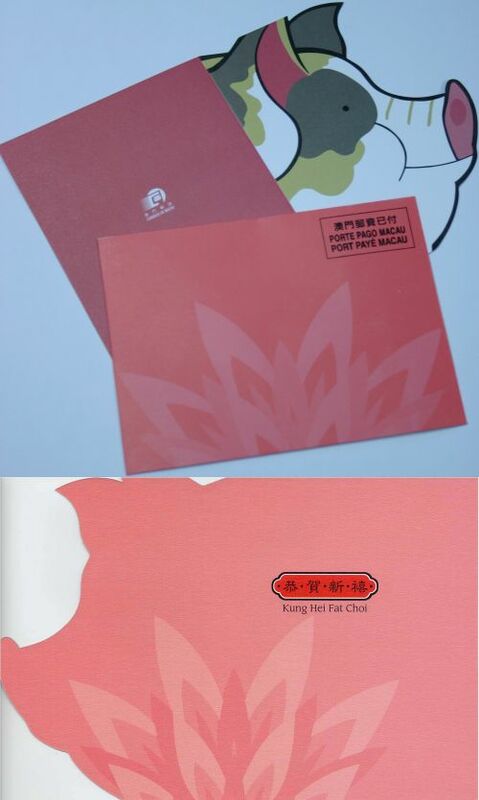 The stamp designer for this issue is Lio Man Cheong, and the text for the information brochure is written by Mr. Vong Chau Son. 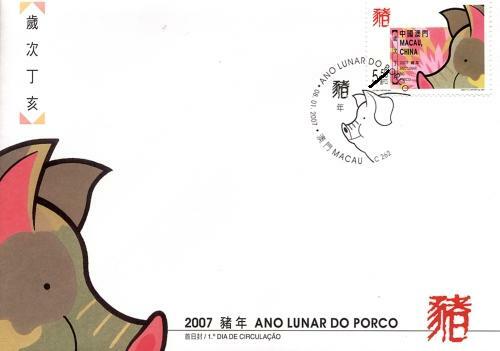 This is the first issue in 2007, and the last issue of the second Lunar Year series. 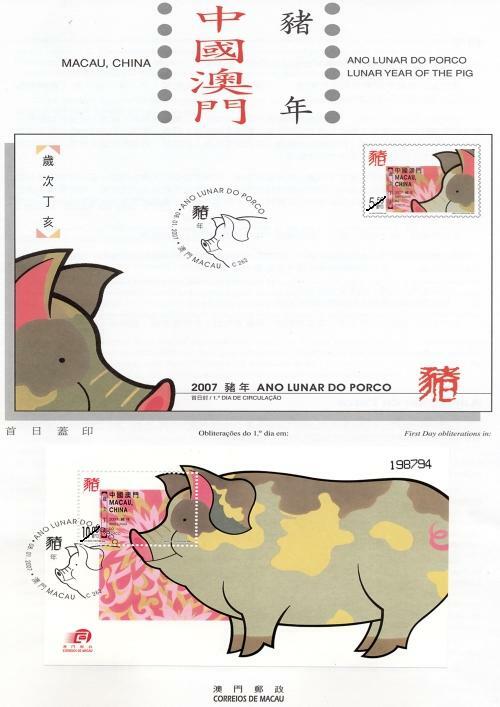 The issued Lunar Year stamps are “Lunar Year of the Rat” on 1996; “Lunar Year of the Ox” on 1997; “Lunar Year of the Tiger” on 1998; “Lunar Year of the Rabbit” on 1999; “Lunar Year of the Dragon” on 2000; “Lunar Year of the Snake” on 2001; “Lunar Year of the Horse” on 2002; “Lunar Year of the Goat” on 2003; “Lunar Year of the Monkey” on 2004; “Lunar Year of the Rooster” on 2005 and “Lunar Year of the Dog” on 2006. Macao Post will issue the Annual Album 2006 on 8th January 2007, it will be available for sale at the Philatelic Shop of Macao Post Headquarters, “Rua do Campo” Post Office, Maritime Ferry Terminal Post Office, Airport Post Office, and the Communications Museum. An elegant and protective hard cover is designed together with the colourful Pekingese (Dog) image combined with silver hot-stamped characters. 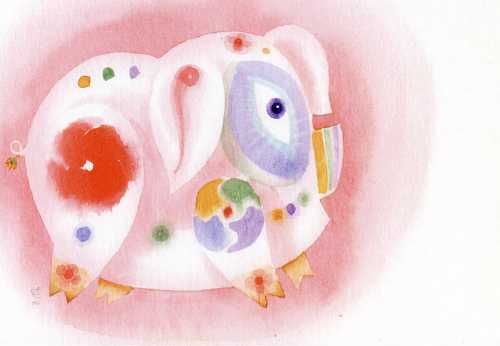 The album contains the full collection of 2006 stamps and souvenir sheets, on which the colour stamp image and the technical data are printed on the pages. This Album is priced at MOP250.00, it is certainly a precious collectable as well as an elegant gift. 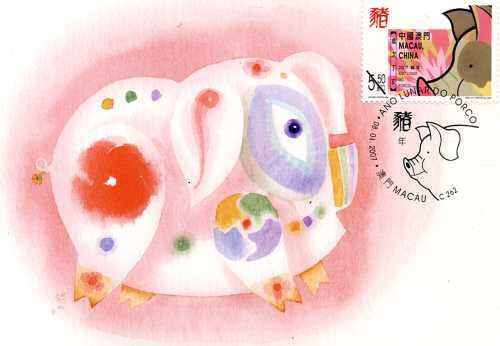 Customers can also purchase the empty Annual Album, by which the purchased 2006 Macao’s stamps and souvenir sheets can be protectively organized. Empty Annual Album is priced at MOP80.00. 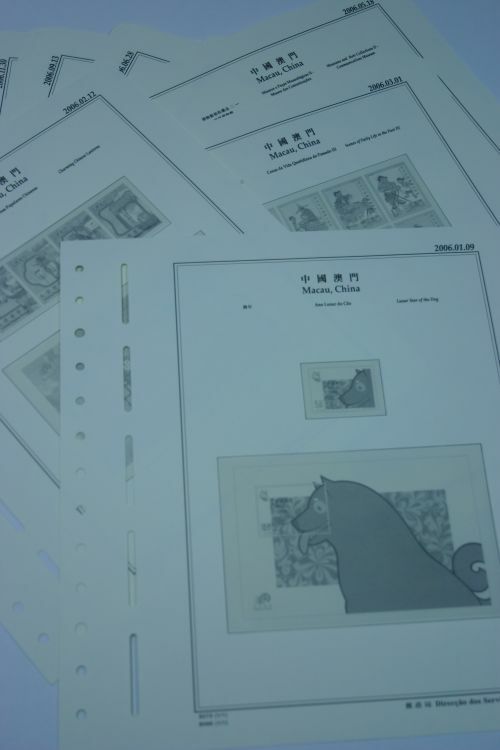 Following the first and second editions “Macao Philatelic Catalogue” issued on 2005, the third edition of the Macao Philatelic Catalogue has also been well-printed. Continuing the previous two edition’s format, it covers well-organized text providing comprehensive background information on all philatelic products issued from 2005 to 2006. 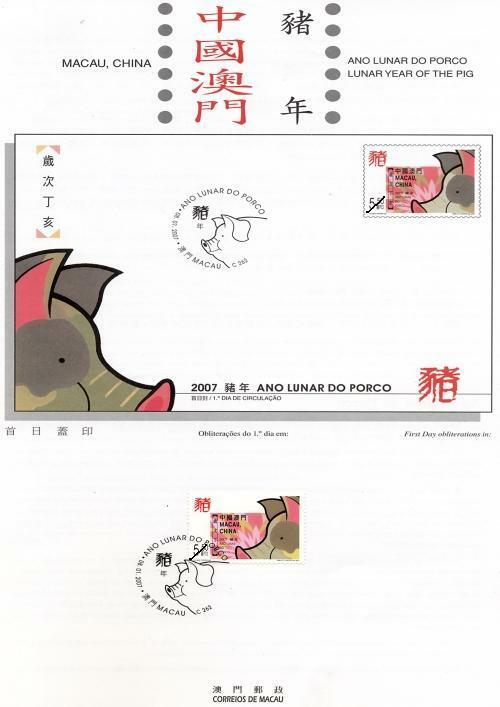 This Catalogue is priced at MOP45.00, it will be available for sale at the Philatelic Shop of Macao Post Headquarters, all post offices and the postal kiosk located near the Ruins of St. Paul’s starting from 8th January 2007. 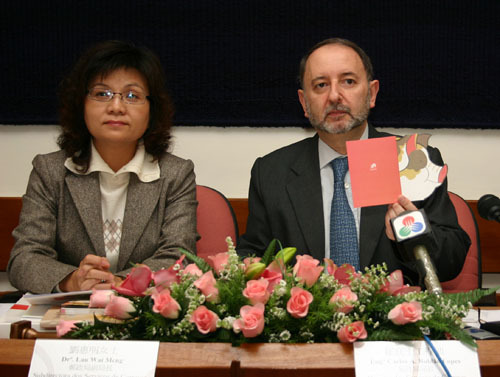 The first edition “Macau Philatelic Catalogue I” covers information of all philatelic products issued from the day of the establishment of the MSAR to 2002, the second edition “Macau Philatelic Catalogue II” covers information of all philatelic products issued from 2003 to 2004, both price at MOP38.00 each. 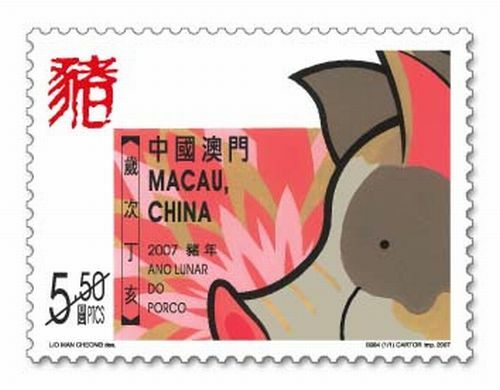 Macao Post will release the “Supplements for Philatelic Album of Macao 2006” on 8th January 2007, it will be available for sale at the Macao Post Headquarters and the Communications Museum. The album pages are pre-printed with all the stamps’ images of 2006. Your collections of stamps and souvenir sheets of 2006 can be put into the pre-printed pages for convenient storage. 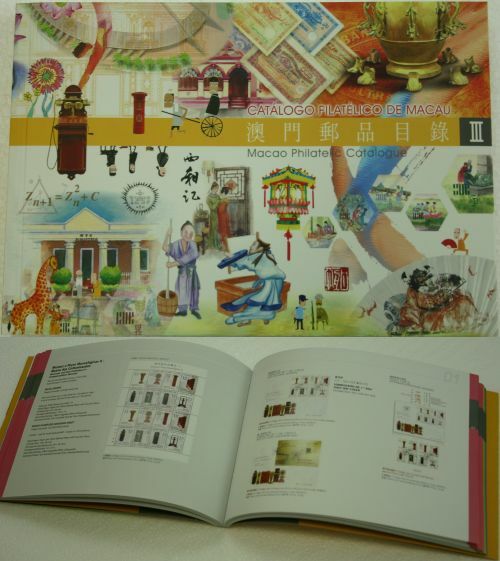 The selling price for Supplements for Philatelic Album of Macao 2006 is MOP150.00. 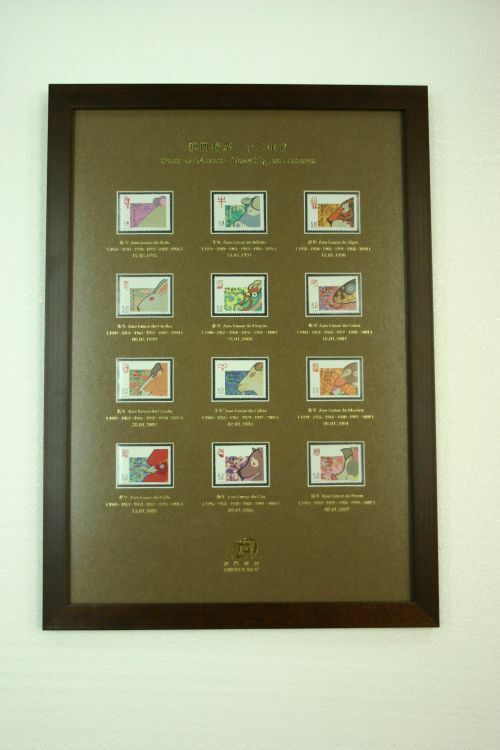 Macao Post would like to advise that the frame of “Macao Stamps – 12 Lunar Signs” will be sold at the Philatelic Shop located at Macao Post Headquarters, from 8th January, 2007, priced at MOP268.00. 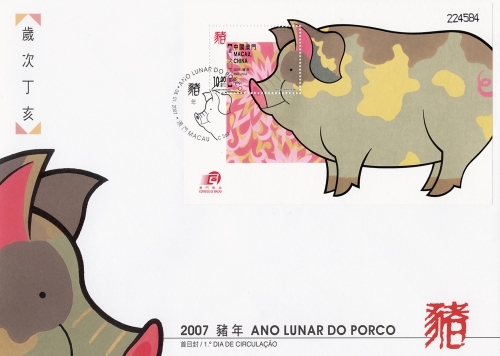 This unique product comprises of the 2nd series of lunar year stamps released by Macao Post since 1996, which will be completed with the release of “Lunar Year of the Pig” stamps. 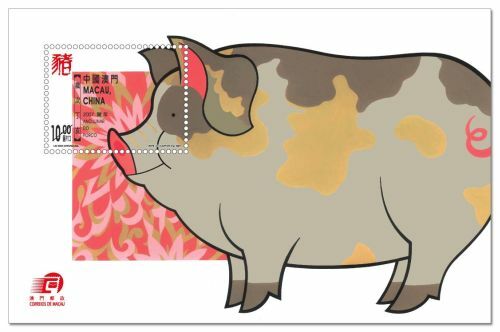 Macao Post will issue a new greeting card for Lunar New Year of the Pig –– “sui ci ding hai” on 8 January 2007, it will be available for sale at the Macao Post Headquarters, all post offices and postal kiosks. 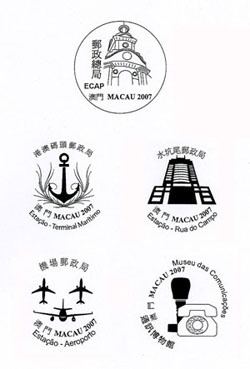 On 8th January 2007, the cachets will be provided for our customers’ commemorative use at the Philatelic Shop of Macao Post Headquarters, “Rua do Campo” Post Office, Maritime Ferry Terminal Post Office, Airport Post Office and the Communications Museum. The cachets let our local residents or tourists to commemorate their visit at the Post Offices. These cachets are for commemoration use only, and do not carry any postal function. The users should not cancel the stamps by these cachets, or the stamps will be invalidated.